Friday, August 24, 2012 Live on SHOWTIME® at 11 p.m. ET/8 p.m. PT From Fantasy Springs Casino in Indio, Calif.
NEW YORK – Former world lightweight champion Juan Diaz will join Steve Farhood and Barry Tompkins as a special guest analyst on ShoBox: The New Generation on Friday, August 24. Diaz, who retired in July 2010, will join the telecast team for a quintessential ShoBox doubleheader headlined by unbeaten bantamweight rising star Randy Caballero against Manuel Roman live on SHOWTIME at 11 p.m. ET/8 p.m. PT from Fantasy Springs Casino in Indio, Calif.
An articulate and personable young man, Diaz is no stranger to ShoBox, having fought on the popular, critically acclaimed boxing series early in his career. In a fight in which he gained valuable exposure and experience, Diaz won a 10-round unanimous decision over Peter Nieves on August 24, 2002, on ShoBox (exactly 10 years to the day of his upcoming announcing appearance). Diaz would go on to face some of the best 135-pounders of his generation during an outstanding 10-year career that began when he was 16. A talented, all-action fighter, he made seven successful title defenses of the World Boxing Association (WBA) title between 2004 and 2007. 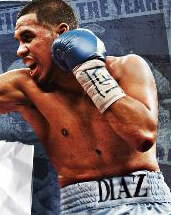 The talented, well-respected 28-year-old Diaz also appeared seven times on SHOWTIME CHAMPIONSHIP BOXING. Nicknamed “Baby Bull,” Diaz won the WBA lightweight crown with a unanimous 12-round decision over defending champion Lakva Sim. Diaz went on to also capture the World Boxing Organization (WBO) and International Boxing Federation (IBF) 135-pound titles in 2007 with victories over Acelino Freitas and Julio Diaz, respectively. In a shocker, Diaz lost the three world title belts on a 12-round split decision to Nate Campbell on March 8, 2008, the first defeat or his career. Diaz went on to face Michael Katsidis, Juan Manuel Marquez (twice) and Paulie Malignaggi (twice) in memorable fights, with his first fight against Marquez being named Fight of the Year. After Diaz lost a rematch with Marquez, the native of Houston, Texas retired at the age of 27 with a record of 35-4 (17 KO’s). While fighting, Diaz maintained a full-time academic schedule, graduating from high school and receiving a degree from the University of Houston. In the August 24 ShoBox main event, Caballero (15-0, 8 KO’s), of Coachella, Calif., will defend his North American Boxing Organization (NABO) bantamweight title Mexico’s Roman (15-1-3, 6 KO’s) in a 10-round bantamweight bout. In the co-feature, talented lightweight prospects Michael Perez (16-1-1, 10 KO’s), of Newark, N.J., and Fidel Maldonado Jr. (13-1, 11 KO’s), of Albuquerque, N.M., will square off in a 10-round bout. Caballero vs. Roman & Perez vs. Maldonado are presented by Golden Boy Promotions and sponsored by Corona. Tickets, priced at $25, $35 and $45, are on sale now and available for purchase at the Fantasy Springs Box Office, by calling (800) 827-2946 or online at www.fantasyspringsresort.com. A full lineup of undercard fights will be announced shortly. For more information, visit www.goldenboypromotions.com, www.fantasyspringsresort.com, follow us on Twitter at www.twitter.com/GoldenBoyBoxing, www.twitter.com/fantasysprings or visit us on Facebook at www.facebook.com/GoldenBoyBoxing or www.facebook.com/fantasyspringsresort. For information on SHOWTIME, visit http://Sports.SHO.com, www.twitter.com/SHOsports or www.facebook.com/ShoBoxing.